Winter weather presents its own set of grooming challenges. Keep beards, long coats, and feet free of snowballs and ice, and towel dry your pet when they come in from playing in the snow. A humidifier can help keep skin from becoming dry and flaky. Use a wet washcloth to clean the feet and stomach, taking extra care to remove any potential ice melting chemicals that could be licked off later. If you like to keep your dog’s hair cut short year round, get a sweater or jacket to help keep him warm when he has to be outside. If you don’t mind doing a little extra brushing, you can allow the coat to grow and keep your dog a bit warmer, but remember that even long-haired dogs can get cold – if your dog seems uncomfortable outside, get him a sweater. Feet suffer the most during winter, so consider taking a towel on walks to clean the paws every so often and keep them free of ice, salt, and other chemicals. Keeping the feet trimmed can help to keep them clean and prevent irritation, making it easier to clean them after walks. You can help protect feet by rubbing a bit of petroleum jelly into the pads. 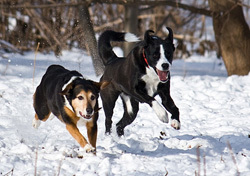 There are even paw protectants made for sled dogs that can help keep feet healthy and clean. For complete protection, consider a set of booties – they are great for hiking, too. Try to bathe your pet as little as necessary, and when you must bathe, use an oatmeal or moisturizing shampoo to keep the skin soft and prevent flakiness. You can also ask your veterinarian about supplements that can help combat dry skin. 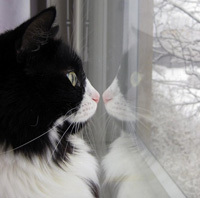 If it is too cold for you to be outside comfortably, it is too cold for your pet, so pets should be inside during the cold winter months and during snow, ice and rain storms. The same is true in winter as in summer – a pet should not be left alone in a car in very cold weather, as they can freeze to death. Make sure your pet has a nice cozy warm bed, something like a blanket or a pillow, that they can cuddle into to stay warm, and make sure they can get off the floor and away from all drafts. Be careful not to leave space heaters alone with your pet or in unsupervised rooms to prevent fires. Don’t forget to snuggle! 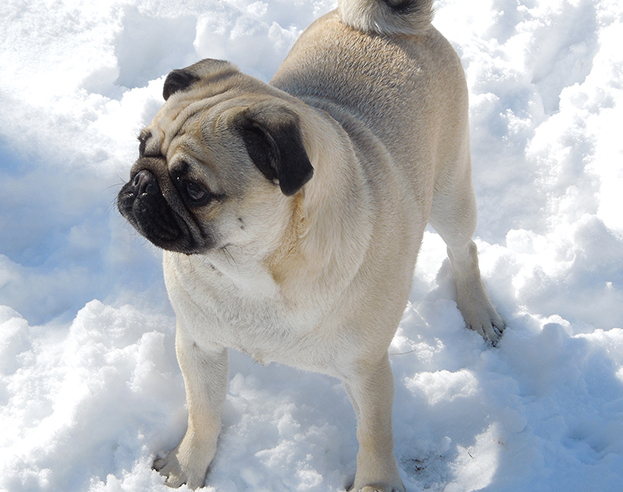 Sharing body heat can keep you and your pets warm!